Let me start off by saying that I don't want to be, or dress like, Meghan Markle. The level of attention and scrutiny that she'll face for the rest of her days is more than I desire. What I do want is to know everything about where she goes and what she wears, as well as every detail that's been revealed about her upcoming wedding (in a genuinely curious, non-stalker-like way, that is). Unlike Markle, I don't remember the last time I wore a sheath dress with a wrap coat or wide-leg trousers with pumps, but in some way, I feel like following her style so closely helps me get to know her a bit better. (Recent thoughts I've had: She's wearing a thumb ring. That helps me understand her. And what will she wear when it's too warm for coats and trousers?) I even wrote an entire story about what she'd buy from Zara if she were to shop there. As soon as the former actress announced her engagement to Prince Harry, I started following Kensington Palace on Instagram. And googling her regularly. And scrolling through old pictures on Getty Images. I'll even admit to watching a few talk show appearances that she made to promote Suits. Not that there's anything wrong with me, but seriously, what's wrong with me? Sure, I'm intrigued by Kate Middleton, too, but more mildly so. Maybe it's because I had so many years to slowly get to know her before she married Prince William, and the engagement didn't come so relatively out of the blue. Perhaps it's also because she didn't have a whole separate, high-profile career before officially becoming a duchess. She never really seemed like a normal girl who led a normal life, at least not to me. Not that Markle's previous life was strictly normal, but I feel like I could've feasibly met her through a friend (of a friend?) when I lived in Los Angeles, or we could've once had the same hairstylist or something. But I digress. Upon contemplating all of this, my theory as to why I'm admittedly weirdly obsessed with Markle and all the princesses who came before her is this: Disney. Long after Disney's first animated feature, Snow White and the Seven Dwarfs, was released in 1937, I grew up watching it dozens of times, along with Sleeping Beauty, Cinderella, Beauty and the Beast, Aladdin, The Little Mermaid, Pocahontas, Rapunzel, Mulan, The Hunchback of Notre Dame, and so on. In fact, I watched Cinderella so many times that I literally melted the VHS tape. As an impressionable young girl, I looked to these princesses as my idea of beauty, style, and general perfection (the rose-colored glasses of youth, if you will). Many of them were plucked from their ordinary lives into fairy-tale ones in an instant, "chosen" because they were special and beautiful but also because many of them were strong, smart, independent heroines. Who, as a child, wouldn't be obsessed with that? Which brings me back to Meghan Markle. Yes, she seems like the star of a real-life fairy tale (she will have her pick of tiaras once she marries Prince Harry, after all), but she's a thoroughly great role model too. Unlike many of the aforementioned Disney heroines, she's used to the spotlight and comfortable using her celebrity for the greater good. She has years of humanitarian work under her belt: writing an essay for Time a year ago, speaking at the UN women's conference in 2015, traveling to underprivileged communities around the world, and advocating for gender equality since she was a child. Yes, she's seemingly living a fairy-tale life, but her main task as a (future) member of the royal family is philanthropy, which she's already fully embraced. Differences from Snow White aside, she's the modern-day version of royalty, and especially as someone who grew up admiring animated royalty, I can't look away. In a sense, she's also the Grace Kelly of our generation, so yeah, I want to know how arguably the most famous woman in the world right now chooses to present herself to the world. After all, it will inevitably influence trends (making her even more fascinating to a fashion girl like myself) and other young girls—rose-colored glasses or none—for many years to come. Diagnosis aside, dressing like Meghan Markle isn't on my agenda, as I mentioned, but below are pieces inspired by the future duchess that would fit right in with the rest of my wardrobe. Give me a polka-dot and these kitten heels, and I'll gladly wear a sheath dress. Markle may or may not experiment with spring's pastel trend, but rest assured that I will. I share her affection for this UK-based brand. Polished black trousers are an undeniable wardrobe staple. Markle wisely chose this bag for a recent appearance. This non-boring pencil skirt will liven up any spring wardrobe. Markle has worn these classic pumps on repeat, and I'm currently seeking this fresh white pair. Since Markle regularly supports British brands, I recommend supporting Alexa Chung's. One of Markle's first appearances with Prince Harry involved an oversize white shirt. She wore the aforementioned shirt style with Mother skinny jeans. Available in sizes 34 to 32. 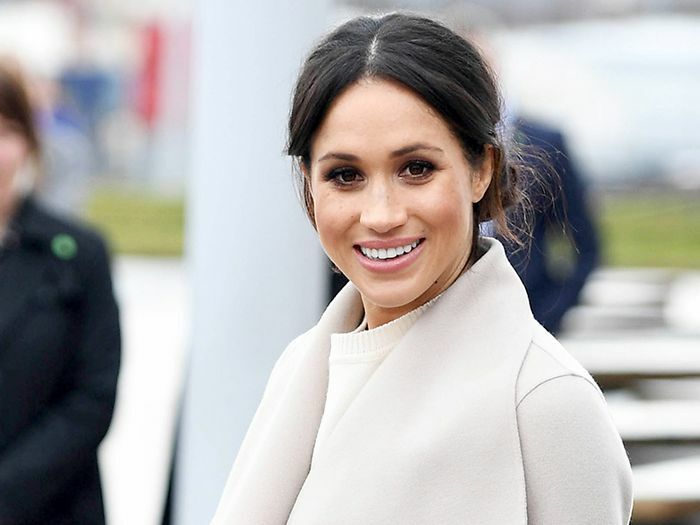 Markle recently tried this fashion girl–approved trend. I'm guessing Markle's spring wardrobe will contain easy pieces like this. These cropped trousers work for the office and the weekend. Markle seems to go for conservative pieces with an of-the-moment twist, like this sweater. As timeless as blazers get. Are you equally intrigued by Meghan Markle's style? Don't worry—Who What Wear will keep you abreast as updates are made available.